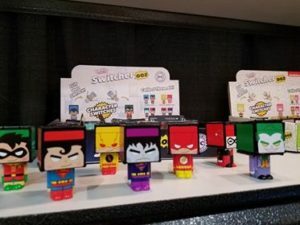 Well, we’re back from our annual trip to the arctic east coast for Toy Fair, where we had a chance to preview—and play with—the latest and greatest toys and games. As in previous years, certain themes are more popular than others. Some are holdovers from last year (often with a twist) or reboots of classics from generations ago. Others are completely new. Here are some of the trends we think will be big this year. James Hamilton, of the popular pop-culture website http://geekstronomy.com was there to lend a hand covering the massive show floor, and we thank him for contributing to this coverage. This is one of the holdover trends. In this case, the twist is a “blister pack,” that shows part of the toy or contents. What’s left is revealed only to the buyer, and the hidden toy is often a rare item. 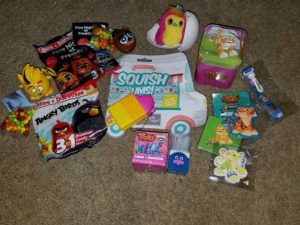 The other big news in blind boxes is that the packaging has gotten very creative, often serving a dual purpose, such as being used as a Christmas ornament, storage tin, or as part of the toy itself. We love this, and think that your kids will, too. As you (should) know, STEM stands for science, technology, engineering and math (we actually prefer STEAM, which adds an A for arts). Construct a robot, learn to code, build atoms, mix colors, and much more. What’s especially cool is that some of these toys are designed for kids as young as three or four months. 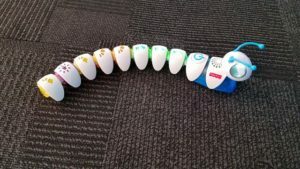 Overall, STEM/STEAM toys are designed to be fun—but there’s plenty of learning stealthily thrown in. This year, education is king. Long live the King. This trend has been strong for a few years now, and since there’s no end to a child’s (or his father’s) fascination with poop and fart noises, we don’t expect it to slow down anytime soon. 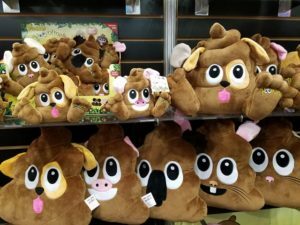 Today, you can find poop plush toys, board games, and no amount of flushing will ever make them go away. 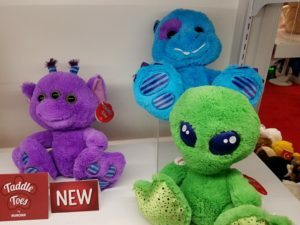 They’re everywhere and in everything: stuffies, blind packs, action figures, pull toys, bouncy balls, pillows, coloring books, crayons (the actual crayons), and contexts you can’t even imagine. 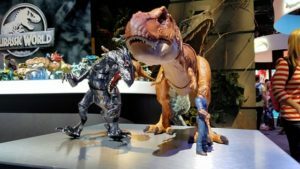 With the new “Jurassic Park” movie coming out shortly, and the 25th anniversary of the original movie (don’t you feel old now? We sure do), dinos are everywhere. You won’t be able to turn your head this year without seeing one—or take a step without tripping on one. In addition to the dizzying array of toys and costumes, there’s an equally dizzying array of books, paleontology kits, and other educational materials that will have your child (and you) in a pter-able state of dino-madness. Donuts and Narwhals are one thing, but what’s with all the bananas, pineapples, and avocados? And how do you explain the popularity of flat stuffed animals? We can’t. These toys, which usually come in large sets, recognize and respond to the child’s actions and initiate games and other engaging activities. While there’s something amazing about the technology, we sometimes miss the good old days when kids actually had to use their imaginations and make up their own games. Toys already stimulate three of the five basic senses: touch, hearing, and sight. But what about taste and smell? A lot of kitchen chemistry toys take care of those two, but one of this year’s big trends is adding scents to non-edible toys. Sometimes the scent is designed to be calming. Other times, it’s just there. Are there so many fidget toys because there are so many fidgety people, or are those toys actually making otherwise non-fidgeters fidget? We’ll never know. This entry was posted in Reviews on February 23, 2018 by Parents@Play Team.